SUP? No, we're not asking what's up (although we certainly do care). We're asking if you want to go on a Stand Up Paddleboard (SUP) journey! Now THAT'S what's SUP! 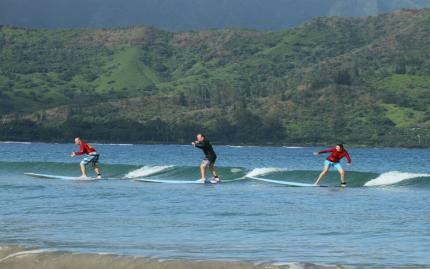 Join in on one of the fastest growing water sports while enjoying the beauty of Hanalei Bay on Kauai! Not only is the tranquility of the water a huge selling point for SUPing, but it's also a great workout and useful in accessing surf that's difficult to reach with prone paddling. 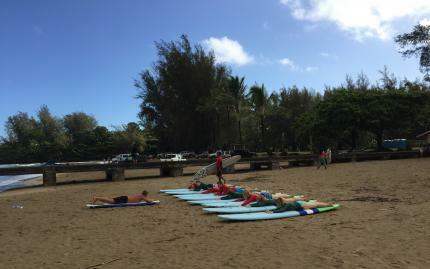 Your experienced instructor will teach you proper paddle form and how to position yourself on the board. Since this is a 3-person lesson, you'll receive all the attention you need to help you absorb the basic rules, methods, and techniques of SUPing so that you successfully and safely embark on your watersport adventure. At least now you know what's SUP! Note: Please enter height and weight of each participant in the "special requests box." This is for 3 person lesson. Please call at least 24hrs in advance to cancel or reschedule. 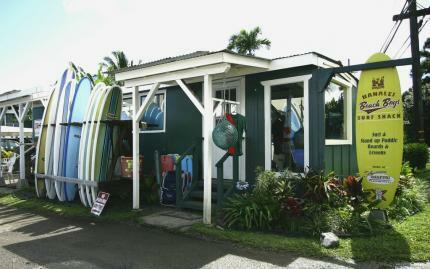 There is a 10% cancellation fee. If you do not call 24 hours in advance, there is no refund and there is a reschedule fee of $20.00 to $50.00 depending on type of lesson.